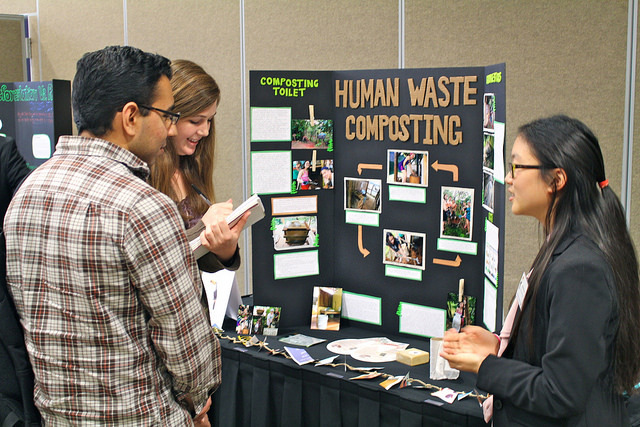 The 2014 UCI Costa Rica Research Symposium was hosted on May 6th, 2014 from 4:30 PM to 7:00 PM in Pacific Ballroom A and B. The symposium allowed each of the seventeen program participants to share the overall impact of the program and the research conducted in Costa Rica. 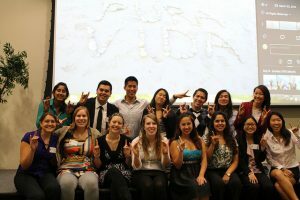 The first forty-five minutes of the symposium was allocated to a short presentation consisting of video clips on what the participants encountered while abroad and the meaning of “Pura Vida,” the slogan of Costa Rica, speeches on the impact of the program, as well as a formal thank you to stakeholders, coordinators, and guests. After the presentation, there was still much time for guests to walk around and see the research each participant conducted. 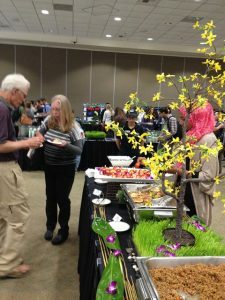 Guests were also free to take delicious, sustainably sourced food provided by UCI Catering. Although the symposium was only two and a half hours, an immense amount of time and effort was put into making the event a success. After coming back from Costa Rica, participants hit the ground running to prepare for the symposium, including completing their research poster boards in an effort to showcase their works in just five short weeks. This year, the program’s symposium committee expressed a desire to articulate each detail that would be presented in the two and a half hour event in order to truly explain the experience and the impact. For instance, the food for the event was supposed to be 100% environmentally-friendly. Unfortunately, due to the high costs, this goal was compensated with Greenware, compostable plates, cups, and forks. 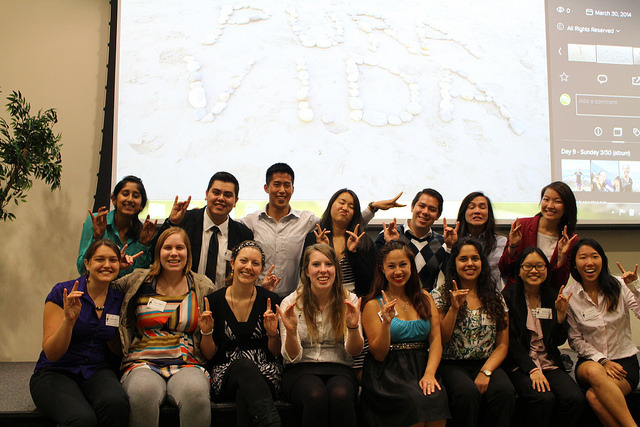 Some of the participants throwing up a Zot at the end of the symposium! This showed the committee that sustainability unfortunately comes at a steep price in a country that is not as sustainable as the parts of Costa Rica we had been in just six weeks prior. In addition, the music of the event was partitioned into two time periods. At the beginning of the event and prior to the presentation, the music consisted of music commonly listened to students today. This was a representation of the seventeen pre-trip participants, who would soon be immersed in the Costa Rican culture and nature. The music after the presentation was limited to the sound of the rainforests, expressing a vision of Costa Rica and the natural sounds that we heard over the course of our ten-day trip. Alongside those details, the main purpose for the symposium was truly for the participants to share their research and lessons learned. 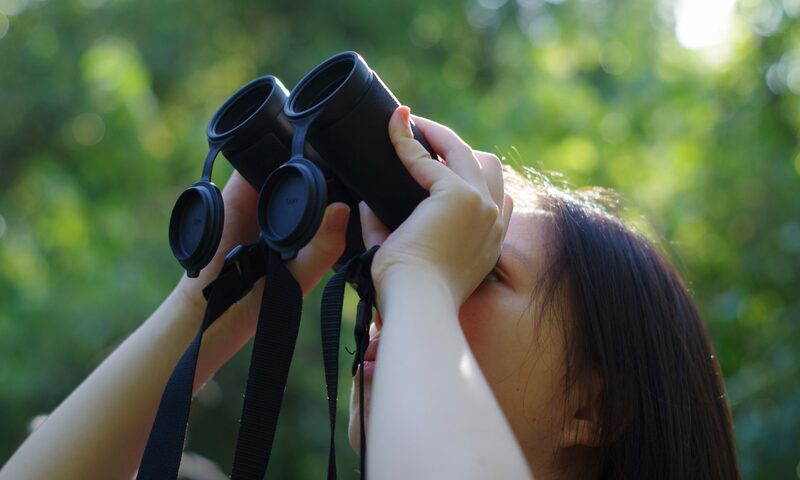 Students not only had the opportunity to be fully immersed in the Costa Rican culture and learn about environmental sustainability, but also had the chance the do a research project. 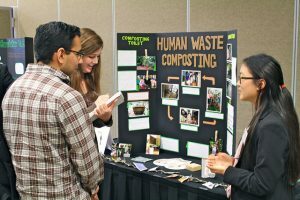 Topics ranged from the benefits of Human Waste Composting to the importance of nutrition in primary schools; from the reasoning behind living a sustainable lifestyle to the overall change in perspectives of the seventeen participants after the program. Overall, participants used this time to share what they uncovered and even shared a bit about their personal experience. Some of the attendees enjoying the delicious food at the event! Although the research symposium was a short period of time, the impact from the experience of the program, as well as the teamwork necessary to make the symposium a success will always be remembered. We hope that those in attendance had the opportunity to not only learn a little bit about Costa Rica and environmental sustainability, but also were encouraged to take action in their community to become more environmental-friendly and culturally-competent. Previous PostPrevious There’s a First Time for Everything!